The Motorola Moto G has been all the rage recently being hyped as the best-spec’d entry-level offering in the market right now. It’s made its way into our offices, and we’re stealing it away for a quick peek before our review team takes it away. 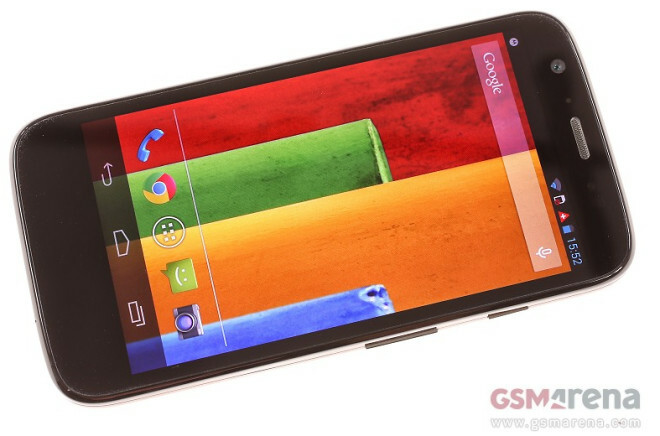 The Moto G runs on a 1.2 GHz quad-core Snapdragon 400 processor with 1GB of RAM and 8/16GB of internal memory. It has a 4.5-inch 720p display covered in Gorilla Glass 3, as well as a 5MP shooter and 1.3MP front-facer, all powered by a 2070mAh battery. The Moto G runs on Android 4.3 Jelly Bean, but is expected to be one of the first midrangers running 4.4 KitKat after next month’s planned upgrade. The Moto G has a pleasantly-textured removable back panel, which can be replaced with one of 7 different color options. Opening the back panel is not the easiest of tasks, but at least it fits more snugly along the device. Underneath, you’ll find the microSIM card slot and the non-removable battery. The construction is solid and features a surprisingly hefty weight for such a relatively small device. The side buttons are a bit tiny, but they make up for that with nice tactile feedback. The Motorola Moto G is not without its share of disappointments, most notably the lack of microSD card to expand the rather limited storage. The non-removable battery is also a drag, and the lack of extras in the retail package (it only comes with a USB cable) isn’t exactly ideal. That being said, some of these downsides are more than made up for by the very low pricetag, and the 50GB of complementary Google Drive storage somewhat compensates for the low internal memory. Be sure to check back with us later this week for our full review on the Motorola Moto G.